Lanzarote is a paradise for people who love the ocean. 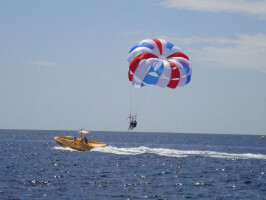 The climate and quality of the water makes it an ideal place to try your hand at water sports. Don’t let the opportunity pass you by! 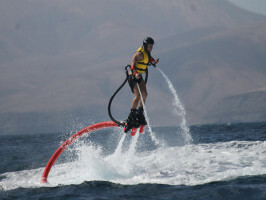 Enjoy Lanzarote’s semi-tropical breeze in the waters off Playa del Carmen with the island’s volcanoes in the background. 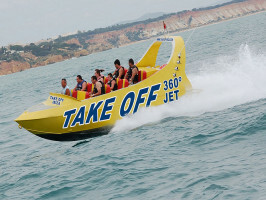 Jet bikes, banana boats, parascending, motor boats…. You choose the ingredients for a refreshing experience on your holidays. 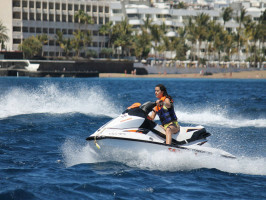 For those who want to experiment with the incredible sensation of speed, there are jet bikes and jet boats. 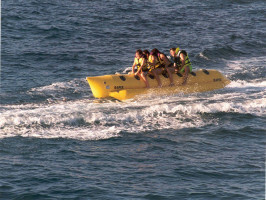 Or, if you prefer more relaxed experience, the banana boats will twist and turn until you jump in the water. 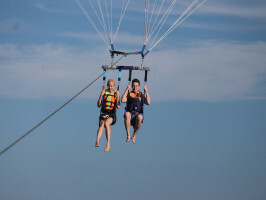 If your dream is to fly over the ocean, then choose the package including parascending. Whether in a pair or an individual, there are lots of options to suit you. Jet bike minimum age to participate: from 16 to 18 years old, should go with a signed parent or guardian.